T10-40 Watt Bulb is rated 5.00 out of 5 based on 1 ratings. 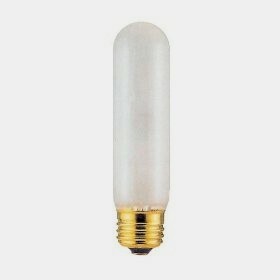 T10/40Watt bulbs are incandescent bulbs with a standard screw-type base. They can only be used for fixtures rated for 40Watts or more. You may also use T10/25Watt bulbs in these fixtures. We sell the frosted bulbs only, they glow. Orders smaller than $59 will have a shipping charge.